Peelaway® Marine Antifouling Remover is specially formulated to effectively remove multiple layers of anti-foul coatings with one application saving time by reducing the need for repeated scraping. Its patented water based poultice system means the product remains active and works without rapidly drying out. The special poultice blanket supplied enables stripped anti-foul paint to be collected easily and so reduces boatyard/dockside contamination risk. The light paste consistency and is easy to apply to vertical surfaces and difficult shapes. It can be applied with a brush or trowel and for larger areas an airless sprayer can be used. Always carry out a test patch before general application. Suitable for most hull types including GRP, wood, steel and concrete. Peelaway® Marine, less time under your boat, more time enjoying it. It is often impossible to know the type and build depth of anti-fouling before coatings are removed. It is essential to apply a test patch to an area typical of the surface to be stripped to ensure the results will be satisfactory. This will also indicate the dwell time required and thickness of paste to be applied. Apply evenly with Airless spray, brush or trowel working into crevices, including on wooden hulls where planks overlap. Ensure raised edges and corners are covered well. Then apply a second coat to the final tested thickness. Finally, lay on the poultice with printing facing outwards, gently rubbing to exclude trapped air bubbles. Work in manageable areas which can be removed within the time scale indicated by the test patch. 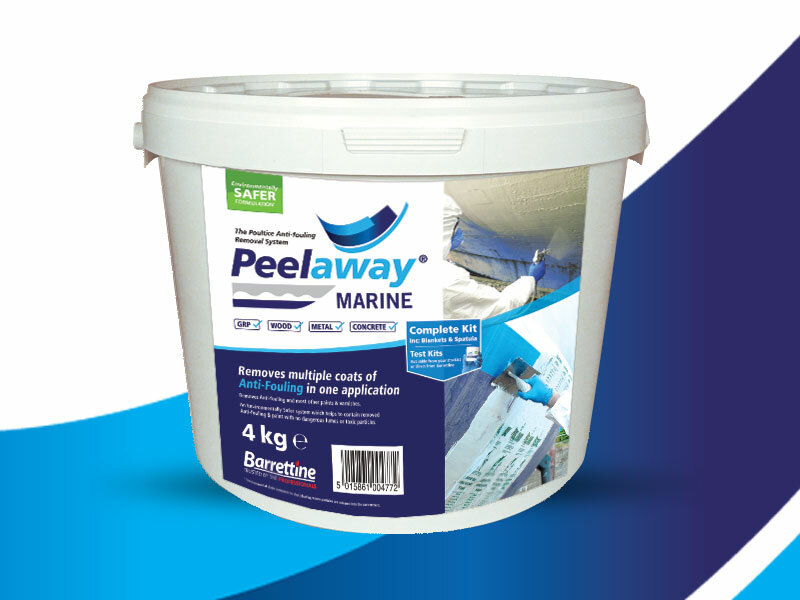 Peelaway® Marine should not be left on longer than 48 hours when used on GRP/Gel coat substrates. Slide scraper into paste and paint, keeping the paint, paste and cover together as much as possible. Take care not to gouge/scratch the gel coat. Steam cleaning or pressure washing may aid removal of residues. Once all the old anti-fouling paint has been removed, any remaining residues of Peelaway® Marine must be cleaned/washed away. Allow the cleaned surface to dry thoroughly before re-coating. A 34 foot racing yacht with badly worn Anti-foul needing replacement. Peelaway Marine was used with precise timing to strip back to the primer layer in just 6 hours. Owner Richard Hunn said "I’m really pleased with Peelaway Marine and I can see the benefits commercially". Our step by step guide to success.